A piece of art in the home can completely alter the way a space looks. From a framed painting to an antique sculpture, nothing says sophistication like having a beautiful piece of artwork that reflects your style. Even a space like the bathroom deserves something to make it as eye-catching as the rest of your home. 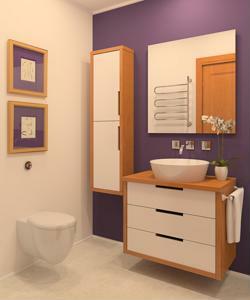 Even with a limited space, there are plenty of things that you can add to a bathroom for that extra touch of elegance. For example, try to make use of the walls - hang a beautiful framed painting right on top of the toilet for a splash of color in the room. If you have a creative side, why not paint a mural and showcase a one-of-a-kind piece of art? Head out to your garden and get inspiration from the flora and fauna for a masterpiece that's waiting to be painted on the wall. You can also let your bathroom fixtures do the talking. There are many options these days when it comes to stylistically designed toilets and bathroom vanities, many of which are works of art by themselves.